WHB #98: Cumin in Kamfounata! | What Smells So Good? Hi there! I am B-A-C-K today and feeling better than I have in a week!!! Whoo hoo for health! Okay, sorry about that little celebratory dance to me lol. I'm sure, though, that my upswing in health is partially due to noshing on the fresh and in some cases still-warm harvest from my garden, a recipe using which I will share with you in this entry for WHB #98 hosted by the original herbaceous diva herself, Kalyn! 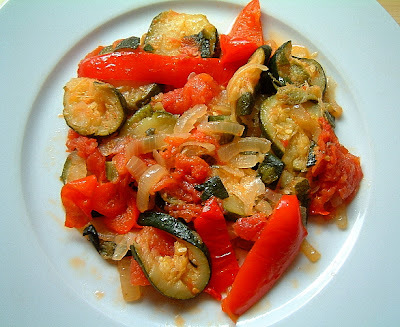 One of the p opular recipes that has been circling the blogosphere since a certain film came out is Ratatouille. Since there are trillions of recipes out there by an equal number of great bloggers, I decided to take this French classic and send it to Africa. To be specific, it was recieving a one-way, first class trip to Morocco, land of one of my favourite films, Casablanca, and one of my favourite herbs, cumin. Cumin is the dried seed of the herb Cuminum cyminum, a member of the parsley family. It is an annual, and it's stems grow about 20-30 cm tall. The leaves are 5-10 cm long, with thread-like leaflets. The flowers are small, and either white or pink. The cumin plant itself grows to 30-50 cm (1-2 ft) tall and it's seeds are harvested by hand. It's distinctive flavour and strong, warm aroma is due to its essential oil content. Cumin was known to the Egyptians over five thousand years ago! Seeds have been found in the Old Kingdom Pyramids at Giza. The ancient Romans and the Greeks also used it medicinally and cosmetically. Cumin is stomachic, diuretic, carminative, stimulant, astringent, emmenagogic and antispasmodic. It is valuable in dyspepsia diarrhoea and hoarseness, and may relieve flatulence and colic. In the West, it is now used mainly in veterinary medicine, as a carminative, but it remains a traditional herbal remedy in the East. It is supposed to increase lactation and reduce nausea in pregnancy. It has been shown to be effective in treating carpal tunnel syndrome, as well as diarrhea, indigestion, and morning sickness. Cumin also shows promise as a natural way to increase breast size. Used in a poultice, it relieves swelling of the breast or the testicles. So, without further ado, I present Kamfounata, Morocco's Ratatouille! Sprinkle the eggplants with salt and leave for 1 hour. Sauté the eggplant and zucchini slices. Add the onion and pepper and cook over gentle heat until the onion is golden and the pepper is soft. Add the tomatoes, salt, pepper, and sugar and simmer about 20 minutes until reduced to a thick sauce. Add the cooked vegetables and spices to the saucepan with the tomato sauce and mix well. Remove from heat. Can be eaten hot or cold (actually great on crusty bread the next day!). Great photo! The colors are so vibrant. I'm very fond of cumin, and I like everything else here, so I'm saying, yes, I'd love some. I like the mix of spices and the dish looks great in the photo.